Armenia appears to be taking the Genocide recognition process to another level by starting to demand the elimination of its consequences. 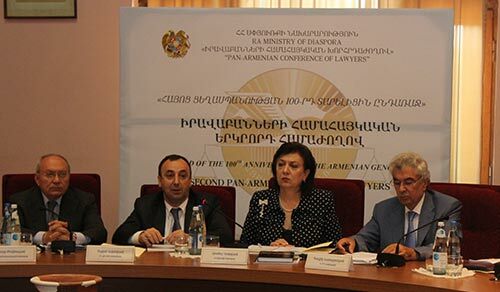 Last week, during a pan-Armenian forum of lawyers organized by the Ministry of the Diaspora Armenian Prosecutor-General Aghvan Hovsepyan made a sensational statement. He said that compensation must be given to the heirs of the victims of the Armenian Genocide, the Armenian Church should recover the miraculously preserved churches and holdings, and Armenia should recover its territories. This was seen as the first territorial claim of Armenia to Turkey made on an official level. The prosecutor general is the carrier of the highest legal authority in the country, and his statement is equivalent to an official statement. Giro Manoyan, Director of the International Secretariat of the Armenian Revolutionary Federation (Dashnaktsutyun) Bureau in Yerevan, commenting on the development, said that it was still impossible to say that Armenia had made a formal claim to Turkey, but it was clear that from just demanding the recognition of the 1915 Genocide Armenia has taken a step towards demanding the elimination of its consequences. In order to get compensation for their lost property heirs of Genocide victims, according to Papyan, should turn to Turkish courts, and if their suits are rejected there, then further seek justice at the European Court of Human Rights. Meanwhile, Papyan added, a suit should be filed with the UN International Court of Justice regarding the border between Armenia and Turkey. The prosecutor general, as well as Armenian political scientists and the Dashnaktsutyun Party believe that Armenia has a sufficient legal basis for claims against Turkey. So far Armenians have preferred working with the parliaments of other countries and seeking international recognition of the Genocide, and more than two dozen countries, including France and Russia, have actually recognized the Armenian Genocide. But now the matter concerns making financial claims. Papyan also noted that now it is a very good time for Armenia to do so as its interests coincide with the interests of the countries that seek the weakening of Turkey and even its fragmentation. “Nobody had expected the collapse of the Soviet Union, but that empire collapsed and new states emerged instead. Today we should speak not about the splitting of Turkey, but rather should be ready for changes that the Middle East is facing today,” said the analyst. In Armenia there is a growing talk about the need to get back to the Treaty of Sevres and Wilson’s Arbitration. According to these documents, the territory of Armenia would have been several times bigger than now and would have included lands of Western Armenia. Today, the Republic of Armenia on the level of its Constitution does not recognize its border with modern-day Turkey and, apparently, intends to start a process of an international revision of borders. It has been said for several years that Turkey is in for hard times in view of the approaching centennial of the Armenian Genocide in 2015. Important recognition acts are not excluded – such as in the United States. Pope Francis, the head of the Roman Catholic Church, has made important statements about the Armenian Genocide and promised to visit Armenia on April 24, 2015, when the 100th Anniversary of the Genocide will be marked by Armenians around the world. Other important activities are expected in the world that many see as possible preparations for the fragmentation of Turkey. It is noteworthy that during these days, in connection with the application of the Foundation of the St. Kirakos Church in Diyarbakir (Western Armenia, now Turkey) regarding the return of 190 pieces of real estate earlier belonging to Armenians, the Diyarbakir Funds Management made a positive decision on 17 units of the property in question. Diyarbakir authorities found only 17 units of property with a total area of 15,000 square meters belonging to Armenians in the Shehitlik Keshkler quarter. However, even the return of this property involves difficulties as the area has illegal structures and public buildings.